Review Reminder extension for Magento 1 allows you to send automated emails to encourage your customers to leave a review of an item they have recently bought. Save time for improving your business while getting a review for every order that was have successfully completed. It is hard to resist the persuasive power of a real feedback. Many potential buyers take more notice of a product with reviews from real customers who have actually bought and used the product than the item without any reviews. Let your customers tell about your products for you. This is cheaper than buying advertising and more convincing than piles of information on the product pages.The more reviews you get, the better visibility you achieve. The importance of reviews in ecommerce cannot be overemphasized. They are an important factor in boosting the conversion rate of your webstore. After every new review, your online store gains recognition and reliability. Online stores that are lacking feedback don’t impress customers. 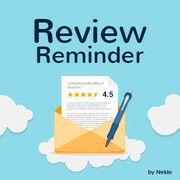 Review Reminder for Magento 1 asks your customers to submit a review for a product they recently purchased from you by sending automatically scheduled email reminders. The notifications are sent within an indicated time period after the purchase is completed, encouraging the customers to share their opinions. When the process of reminding customers about leaving reviews is automated, you have more time to spend on the business issues and improving your customer service. 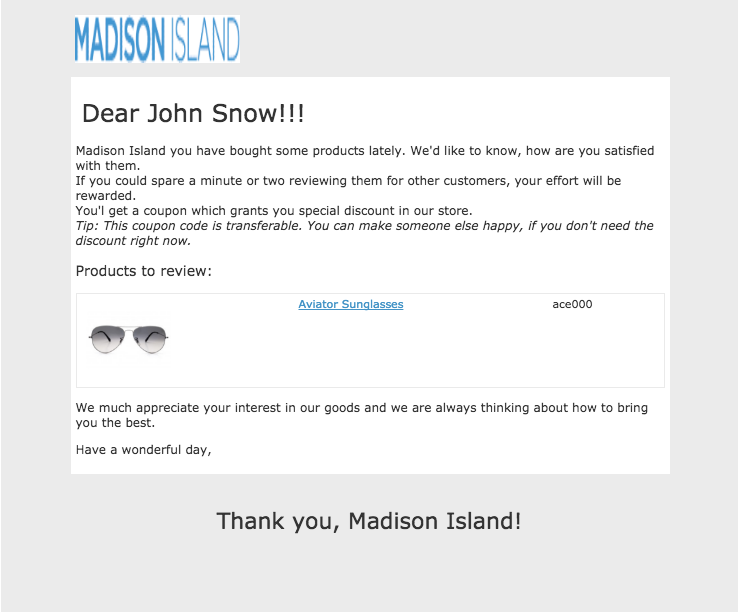 Sending automated email notifications is a proven way to collect real feedback and establish strong customer relations. 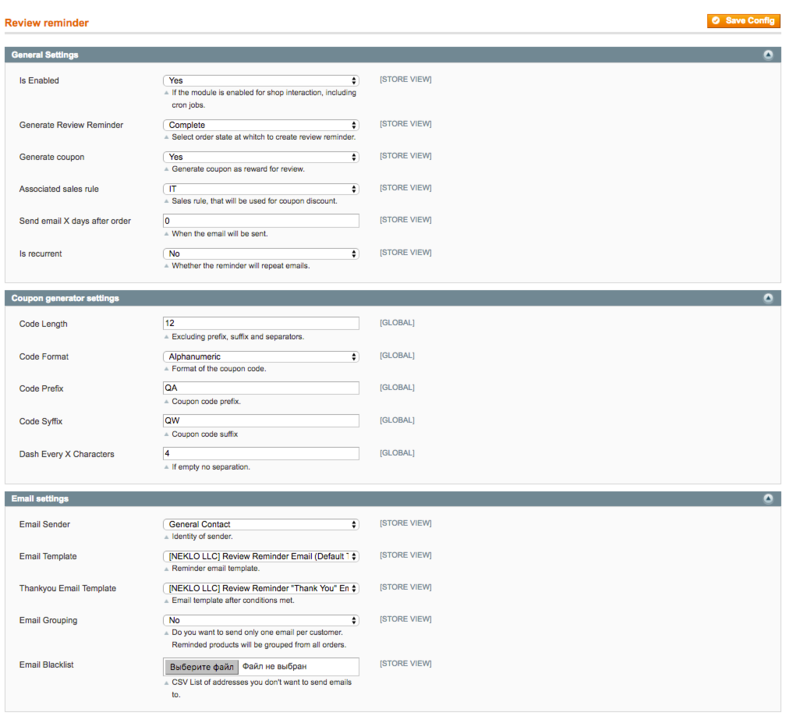 You can adjust the email template depending on the message you want to deliver. 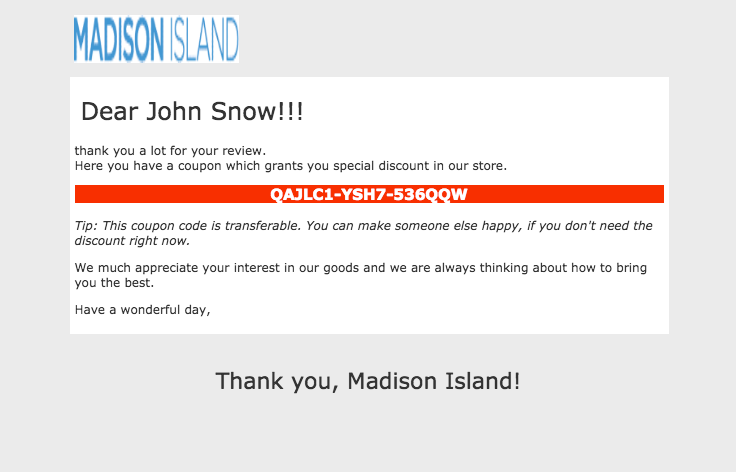 Also, there is an option to thank your customers for submitting an informative review by attaching automatically generated discount coupons to the emails. You can select the order state in which the review reminder is generated. It is also up to you whether to create a coupon or not, how many days after the order the reminder should be sent, and if the notifications are recurrent. Set multiple variations for coupons. Indicate optimal length and format of the coupon code, by choosing code suffixes, prefixes and the amount of dashes. You can identify the sender, customize the email template and group the emails. You can upload a CSV file with the emails of customers that you don’t want to bother with notifications. Being honest is more worth to a customer than a price cut. With the Review Reminder extension you can show your customers that you care about improving your service and encourage new customers to buy from you based on the realness and regularity of your reviews. Works perfectly and Neklo support awesome. Great extension. We’ve been getting lots of feedback from our customers since we installed it. I think, that is because of the promo codes we send them. Anyway, the extension does its job pretty well and as described.